New Instructional Video WITH KARL DEMPWOLF! 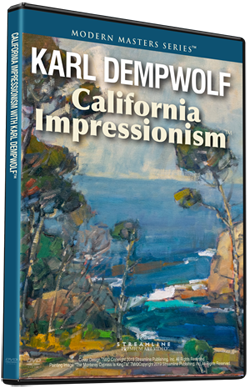 For decades, Karl Dempwolf has made it his life's work to learn from the paintings of these great masters and figure out just how they made such wonderful compositions, found such rich yet tasteful colors, and used such wonderful brushwork. Karl's rare workshops are in high demand, and few people actually get the chance to study with him - because he plans to spend the rest of his life painting, not teaching. Before he stopped teaching, we convinced Karl to preserve his lifetime learning on video, so he can share it with you and so his years of discovering these techniques will not be lost. This video will help you advance tremendously in your own painting, even if California Impressionism isn't your exact style. These techniques are priceless and can be applied to all kinds of painting and painting mediums. You'll get to share in Karl's decades (yes, decades!) of experience and put it to work for yourself, saving you years of trial and error. Best of all, your own personal look and feel will evolve as your paintings get better and better.